Where you stand now is the management level for Mono Lake—6,392 feet in elevation. One day, Mono Lake’s water will again reach this level, but ensuring this was a long struggle. In 1976, a group of researchers, including David Gaines, came to the Mono Basin and found if the lake continued to drop and increase in salinity, there would be a total ecosystem collapse. The decreasing lake level caused the islands where California Gulls nest to become connected to the mainland. The brine shrimp and alkali flies which millions of migratory birds depend on were also threatened, due to the increasing salinity. Benchmark Tufa over the years. 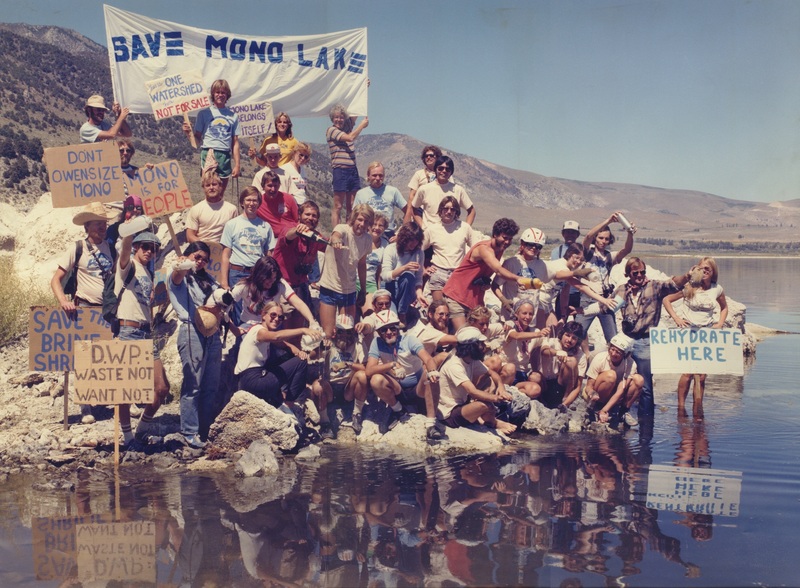 Inspired to act, two years later, David Gaines and several others founded the Mono Lake Committee—a non-profit citizens group dedicated to protecting and restoring Mono Lake, and educating people about this remarkable place. Gaines went around the state giving Mono Lake a voice and telling people what was at stake if this ecosystem collapsed and the public responded. Inspired by Gaines’s vision, the Committee grew to 20,000 members and attained legal protection for the lake. Activists carry water to Mono Lake from its tributary streams in the Rehydration Ceremony in 1982. Photo by Stephen Johnson. The struggle to save Mono Lake got a big boost after it was decided the public trust doctrine, which states that resources belong to all people for values including wildlife habitat, nature study, and scenic beauty, applies at Mono Lake. 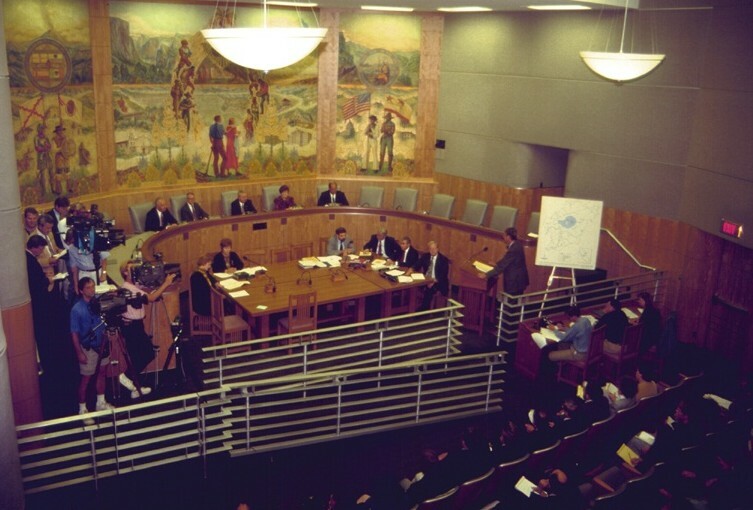 This ultimately spurred the landmark decision in 1994 when the State Water Board modified DWP’s diversion licenses to protect the lake and its tributary streams. The State Water Board ordered DWP to allow the lake to reach a healthy level of 6,392 feet. Now the amount of water Los Angeles can take each year depends on the lake level. Moreover, DWP was charged with restoring the stream and waterfowl habitat that suffered from the dry streambeds. Today the Mono Lake Committee continues to make sure the decision and protections put in place are upheld. If you stop by the Mono Lake Committee Information Center & Bookstore), you can get your own bumper sticker for free! The Committee has also worked with Los Angeles to encourage water conservation. In the 1990s, the Committee, along with other organizations, worked with LA to replace over one-million water consumptive toilets, saving eight billion gallons of water a year. Los Angeles continues to be water-conscious by using water reclamation, incentives for lawn replacement, and storm water recapture. Today, the city uses less water than it did 40 years ago, despite a 25% growth in population. Look toward where the water is today, and imagine it lapping at your feet right here. That rise in lake level that will happen in the years to come represents thousands of people fighting for Mono Lake. 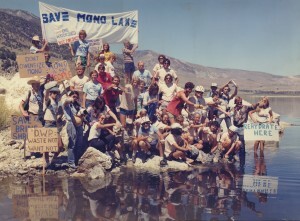 You too can join the fight to keep saving Mono Lake by becoming a member! Continue toward the lake until you reach the shoreline.